1. How to create additional geometry for setting the position of the hardware component? 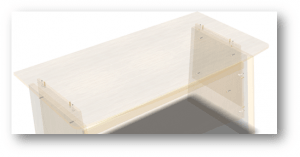 Woodwork for Inventor significantly speeds up the hardware placement process. You can place multiple instances of hardware using model geometry and some additional work planes as a reference. Use the Plane creation tool. 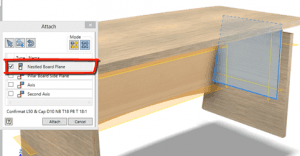 Create work planes that are necessary to set the position of the central axis for placing hardware elements using an offset from a selected plane or edge. 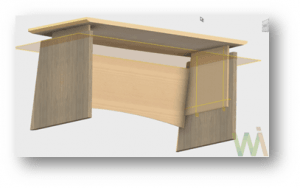 You may need to create some more work planes to determine the position of the central axis necessary for the placement of the remaining hardware elements. 2. How to insert a hardware component? 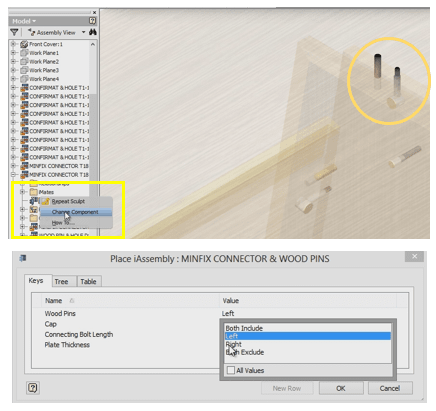 Use the Place command in the Attachdialog window to place necessary hardware elements in the workspace. You can also use a library hardware component provided with the Woodwork for Inventor add-on. Click on requested geometry. In our case, when all Nestled Board Planes are selected, click “Axis” in the Attach dialog window and select a vertical work plane. Then click on “Second Axis” and select a horizontal work plane. Click on the “Attach” button and all hardware components will be sucesfully placed at the intersections of work planes! Then you may need to make changes to the configuration of the inserted hardware components. Place all necessary hardware components. 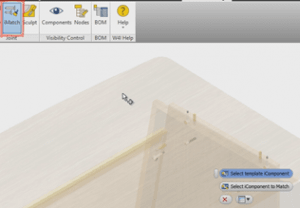 Use the Components Visibility control window to temporary disable Woodwork for Inventor components. You cannot perform any tasks with disabled components. Now you can see all hardware components in the model and change them if necessary. 5. How to change the configuration of hardware components and how to match it with the selected reference component? Sometimes you may need to change the configuration of the hardware or other components that have already been inserted. For example, the position of a hardware element (minifix) and a wooden dowel inserted alongside it needs to be switched in respect of one another. 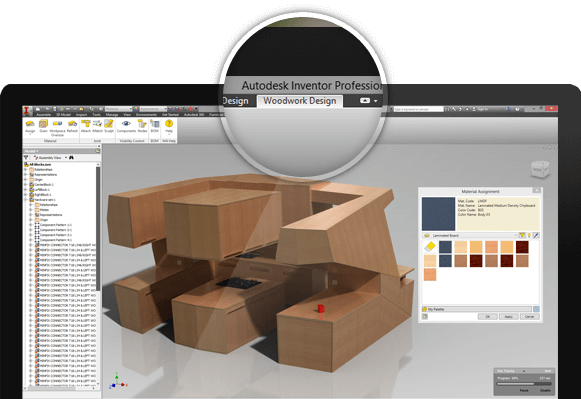 Woodwork for Inventor significantly speeds up this process allowing you to match multiple hardware instances by simply clicking on them. 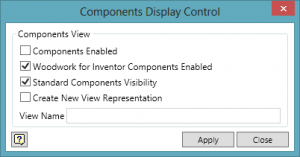 Right click to open a menu window and click “Change Component” to change the configuration of hardware components. This changed component will be used as a template for changing the configuration of other hardware components. Run iMatch command. Click on the template hardware component, then click on the components which configuration needs to be changed into a template configuration. Use the Components Visibility control window to turn the component visibility back on. 6. How to generate holes needed to insert a hardware component? 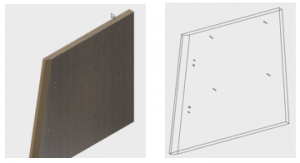 Woodwork for Inventor hardware components carry not only assembly hole geometry but also the construction links required to insert them into the furniture model. 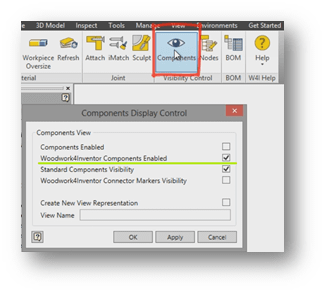 Use the Components Visibility control window to enable/disable all Woodwork for Inventor components and standard components. Hidden (or disabled) components will be ignored during the hole generation process. Click “Sculpt” to generate holes. To remove holes from the model, click “Clear”. 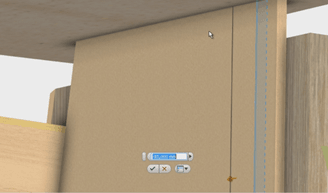 Now all required holes are physically generated on all planes in your model. Invisible planes or invisible hardware components are excluded from the sculpting operation. Components without a material assigned to them are also ignored in the sculpting process. play_circle_filled 1. How to create additional geometry for setting the position of the hardware component? play_circle_filled 2. How to insert a hardware component? play_circle_filled 3. How to place hardware components? play_circle_filled 4. How to control the visibility of hardware components? play_circle_filled 5. How to change the configuration of hardware components and how to match it with the selected reference component? play_circle_filled 6. How to generate holes needed to insert a hardware component?